More than 20,000 visitors got a chance to admire Zaha Hadid Architects‘ latest project when the King Abdullah Petroleum Studies and Research Centre (KAPSARC) opened to the public for the first time during Saudi Design Week. The center, located in Riyadh, is a non-profit dedicated to investigating policies that aid in efficient energy usage, and as such, was built with this mission in mind. KAPSARC is one of several projects designed by Zaha Hadid before her passing, and is the first building by the firm to be awarded LEED platinum certification. The sprawling 17-acre campus is composed of five different buildings that come together as a unified whole, rising as gleaming white pods from the earth. The modular design allows for expansion in the future, as new structures can weave easily into the honeycomb design. The faceted form of each building creates a flowing geometric lattice up the facades and allows for cutouts to both let in light and minimize construction materials. The individual spaces, though harmonious, have been adapted individually for their functions as a library, computer center, auditorium, research center, and prayer space. 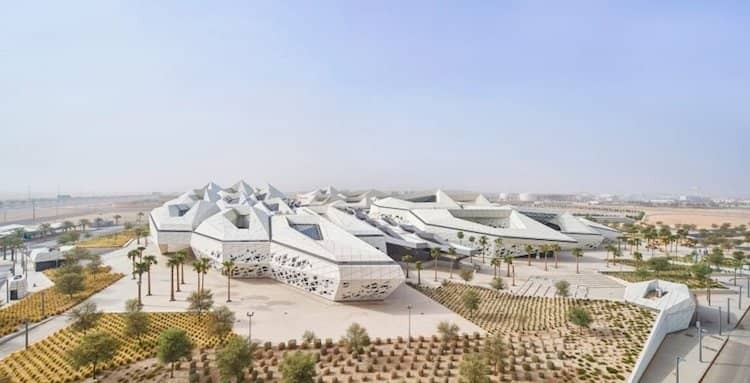 “This structural and organizational principle determined KAPSARC’s composition as an amalgamation of crystalline forms that emerge from the desert landscape, evolving to best respond to the environmental conditions and internal program requirements,” writes Zaha Hadid Architects. Exterior canopied courtyards were carefully planned to minimize exposure to the oppressive desert climate, allowing for community building space where thoughts and ideas can be exchanged in an informal setting. Special “wind catchers” on the roofs of the southern side of the courtyard harness north winds to cool the spaces, which are oriented to allow only indirect sunlight. The concept of mixing the visiting public with researchers is carried throughout the building, as open plans and spatial layering effects allowing visibility between floors creates a sense of transparency. And with all of KAPSARC’s potable water reused and recycled, solar panels with a capacity of 5,000 megawatts per year, and 30% of construction materials made of recycled content, the architects certainly lived up to the mission of the buildings. Zaha Hadid Architects, which recently won a Blueprint Award for their Port House in Antwerp, isn’t new to working in Saudi Arabia. The firm is currently working on a wetlands preservation center in Diriyah and a metro station in Riyadh. Zaha Hadid Architects’ King Abdullah Petroleum Studies and Research Centre in Riyadh recently opened to the public. The 17-acre campus is composed of five buildings that rise up from the desert landscape. KAPSARC is the firm’s first LEED platinum certified building. All images by Hufton + Crow. The post Zaha Hadid Architects’ Energy Research Campus in Riyadh Opens to the Public appeared first on My Modern Met.